It’s a busy time in the Bibliomanse. The immediate task (on top of production, marketing, arranging tours, getting all the holiday orders out, getting the spring season into a shape that doesn’t make us all want to open-mouth sob, etc.) 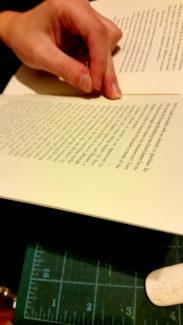 is the production of handcrafted chapbooks. Against Amazon is a short manifesto written by Biblioasis author Jorge Carrión. As with his hugely successful travelogue and love-letter to book stores everywhere, Bookshops, Carrión’s chapbook concerns itself with the state of the book. Against Amazon is exactly what it sounds like — an author explaining how damaging Amazon is to the world of the book. 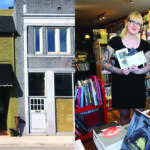 Dan loved the manuscript and immediately decided to turn it into a chapbook – an objet d’art to celebrate the independent bookseller from an independent-bookseller-turned-indie-publisher. 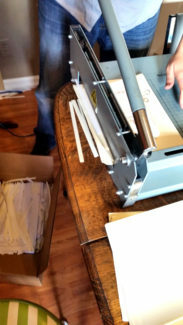 Production Manager Chris Andrecheck and Local History Editor Sharon Hanna sewing chapbooks. Sharon is one of the few people Chris allows to touch the books. Then he berates her. Chris’ blood pressure is one billion over one billion. Amazon. Within hours of offering the chapbook to independent booksellers, Chris received orders for over five hundred chapbooks. On top of that, the publicity department (Chris’ sworn enemies) gave away most of his existing stock to reviewers. With orders continuing to come in, Chris has developed a feverish look in his eye and is never without some sort of book-binding weapon in his hand. We’re not sure we’ll all make it. He removed the safety to better control the trim on his books. No one is permitted to TOUCH the cutter except Chris. Against Amazon is only available through independent bookshops (call your local shop!) 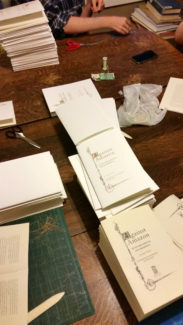 and each copy was hand-folded, hand-stitched, and hand-trimmed by one of us here at the Bibliomanse (usually after work hours; sometimes while \drinking and practicing for Futuramatrivia night). Most of the books were made by Chris himself (and then he quality controls the ones the rest of us were permitted to make because he does not trust us). Bookshops is available everywhere and is getting terrific reviews all over the place! Read that book that started Carrion’s crusade against Amazon and Cultural Department Stores and that has been named a Globe and Mail top 100 book of 2017, a National Post 99 best books of 2017, and one of Maclean’s 10 best books of 2017.